Royal Star papayas are large, elongated fruits that are cylindrical but can be somewhat pear shaped and measure around 20 centimeters long. Smaller than a Mexican papaya, each fruit can weigh between 1 and 2 pounds. The skin ripens from green to yellow and can develop orange or red coloring when fully mature. They are harvested when green and still underripe and will continue to ripen over the course of a few weeks. Royal Star papayas can be enjoyed even when half ripe, making when to determine ripeness a bit less of an issue. The bright, orange-red flesh is firm and juicy, offering a sweet, tropical flavor. The star-shaped seed cavity contains hundreds of small, edible, round black seeds. Royal Star papayas are available year-round. Royal Star papayas are a new hybrid variety of Carica papaya. 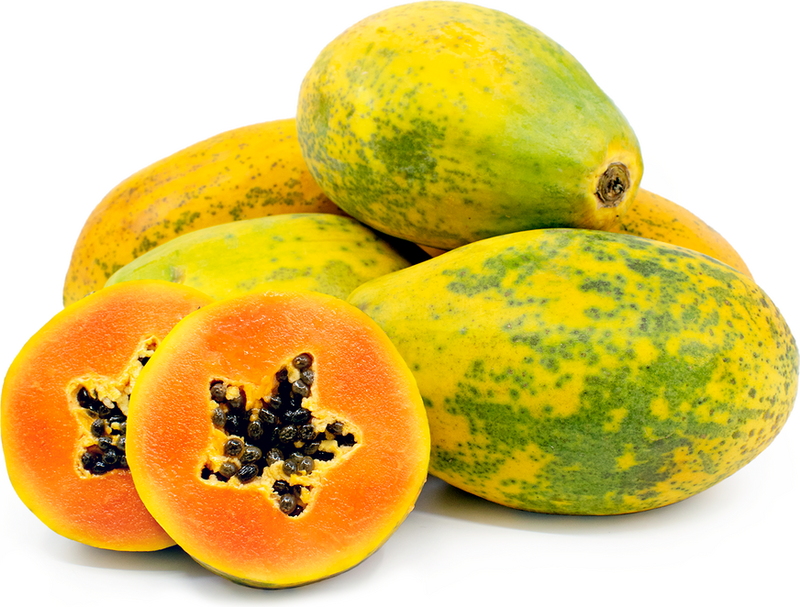 The Mexican-type papayas were introduced to the United States and Canadian markets in 2011. They are known for their smaller, more personal size, extremely sweet flavor, star-shaped seed cavity, and extended shelf life. Royal Star papayas will keep for twice as long compared to other varieties, making them easier to ship to greater distances. Royal Star papayas are nutrient dense, high in beta-carotene and contain 212 amino acids and several important enzymes like papain. The fruits also contain high amounts of fructose, measuring 14 on the brix scale, making them one of the sweetest varieties. They are rich in vitamin C and are a good source of vitamin A, potassium and folate. The fruit contains vitamins E and K, all the essential B-complex vitamins and the minerals calcium, magnesium, phosphorus, copper, manganese and selenium. They also provide nearly all the recommended daily intake of omega-6 fatty acids and are a good source of omega-3 fatty acids, both of which are essential for brain and heart health. Royal Star papayas are most often eaten raw, but they can also be cooked or baked into dishes. The fruits can be cut in half and sliced and eaten as is or diced and added to fresh salsas, green salads, fruit bowls or smoothies. Cubes can be dusted with tajin or chile powder and eaten as a snack. Diced Royal Star papaya can be used for a spicy chutney or the base for a compote or tart. Puree the flesh and make sauces or jams, beverages or cocktails. Add to baked goods or make into frozen desserts. Pair papaya with other tropical fruits, berries, chicken, strong cheeses, and nuts. Uncut Royal Star papayas will keep for up to 2 weeks. Cut fruit will keep in the refrigerator for up to 5 days. Royal Star papayas are grown by third generation farmers in Colima, Mexico and south Texas. The family, who live near the Mexican border have close ties to the community of Colima, where they have been growing the Mexican papayas for decades. In 2012 the farms were awarded a Global Food Safety certification, to guarantee the safety not only of their product, but also of their growing, shipping and storage facilities. Royal Star papaya was discovered in 2007 in the small state of Colima, Mexico, located on the western central coast. They are a natural hybrid of the Mexican papaya and share some of the same characteristics. The fruits, and their seeds, are a proprietary selection from an Alamo, Texas-based company who also exclusively grows and distributes the papayas. 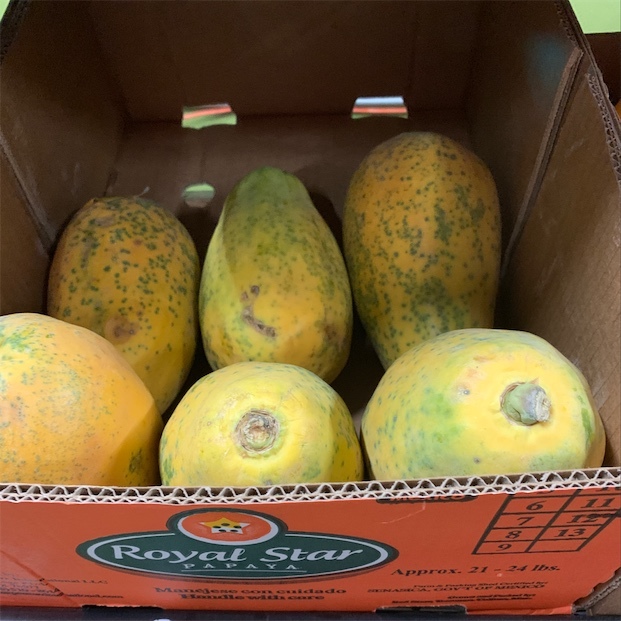 Royal Star papayas are shipped to at least 2 dozen states in the United States and Canada and in 2013 they were first shipped to Spain, with the goal of eventually being available in Germany and Portugal. Recipes that include Royal Star Papayas. One is easiest, three is harder. 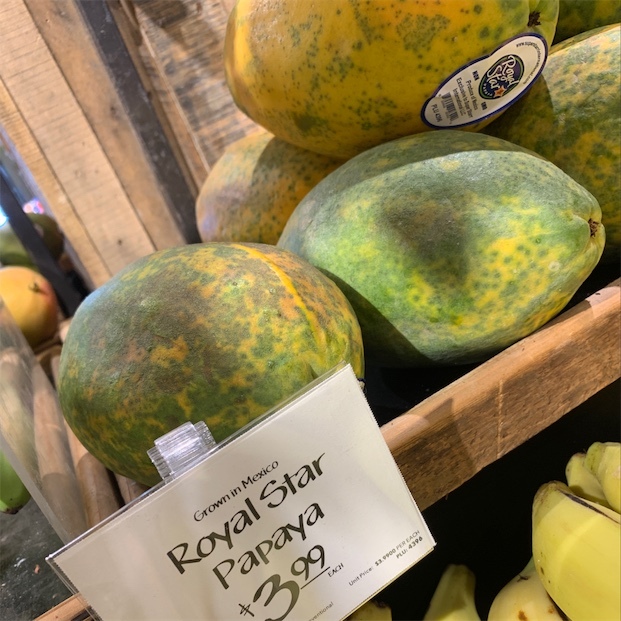 People have shared Royal Star Papayas using the Specialty Produce app for iPhone and Android. Sharer's comments : Royal Star Papaya! Sharer's comments : Ripe papaya !